This film came out the same year as QUO VADIS but several months before the MGM epic. It was a sort of a FOX answer to Paramount / DeMille's SAMSON & DELILAH. Excellent production. Boring as hell though. Gregory Peck's heart was definitely not into this stuff. Susan Hayward had more fun with it but everything about this film is slow and sorta misconceived. Say what you will about DeMille (he was corny, etc), his films were entertaining. This scene with Goliath happens at the very end and it's way too brief. Walter was 7'2". This was his only film. I agree this movie was a bust. 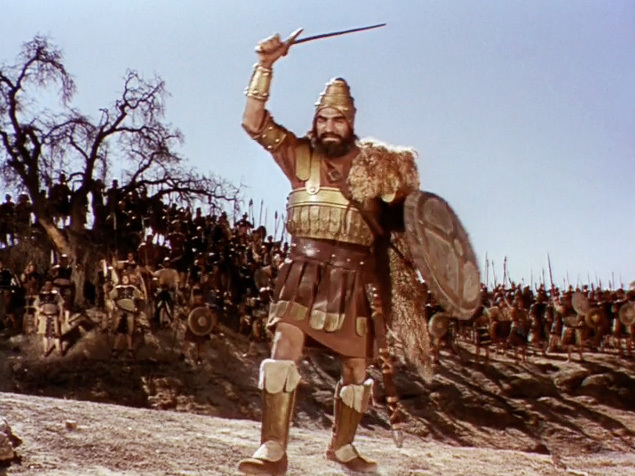 Admittedly peplum/sword and sandal flicks were not Gregory Peck's best genres. However, he was pretty good as King David in DAVID AND BATHSHEBA (1951).